There’s usually a certain optimism that finds its way into conversations about the growth of technology and its uses. Granted, many people I’ve talked to have their reservations in this or that area, and almost no one is under the illusion that all the world’s problems will be solved by merging with the machine. But even so, something like the internet is exciting for those exploring it, especially for the first time. I detected a bit of this within Juana María Rodríguez’ chapter on cyber culture and internet sexuality in Queer Latinidad. Her observations are measured, and she maintains that the aspect of the internet she explores does not allow users to do anything they could not have done before. But for those with the means of access, the web allows them to communicate faster and more easily, and most importantly with a degree of anonymity. By entering this kind of discursive cyberspace, text and imagination proxies one’s physical appearance, allowing the user to perform multiple different personas at a time in appropriate settings. This is what excites Rodríguez: the fluidity, the seemingly limitless recombination of experience and fantasy into narratives that are simultaneously imagined yet very real to their participants. Unfortunately reading today, I can’t help but feel like the Web she describes no longer exists, or at least persists to a much reduced degree. Rodríguez writes in 2003, when the World Wide Web remained largely unmapped, and IRC chat rooms occupied a sort of underground. Most importantly, she writes before the meteoric rise of social media. She begins her virtual study “with the assumption that [her] online desires would somehow align with [her] real-life sexual practices,” but found the exploration and performance of different personas to be enjoyable and rewarding on levels she had not expected (129). Extending to more than sexuality, this kind of free undulation in discursive space, with channels constantly emerging, shifting, forgotten, subsumed, encouraged interactions and performances that were just as fluid and fluctuating. At the time, users could cycle through any number of anonymous nicknames describing interests or identity in order to distinguish themselves in chat rooms and on forums. These could be erased and recreated at will. The cross section of internet users with whom users interacted varied depending on which rooms they entered and left. But chronicle the emergence of the MySpace profile and see the beginnings of a reintegration of the virtual self and the self “IRL” that has continued to this day. Originally, MySpace allowed you to choose a “display name” while keeping your “real name” hidden. Compare that to Facebook today, where creation of a profile requires you to use your birth name (though many people find ways to get around this). Most fields in the “details” section could be filled via one of several selections from a drop-down menu, with only a few allowing for typed text. 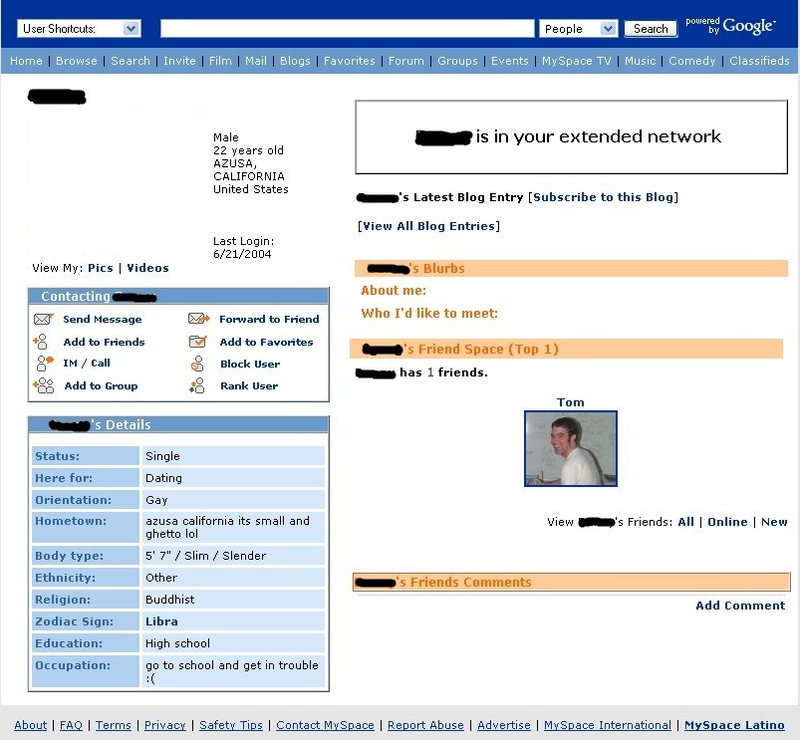 When using MySpace, you are either Female or Male, here for Dating/Networking/Friends/etc. You are straight or gay. Your body type must conform to one of three or four options. Though these fields could be changed freely, it is important to note that this kind of self-identification involves selecting an answer in a box that some web designer has written. It eliminates many of the opportunities for the kind of elegance or creativity Rodríguez shows when responding to the standard “m/f?” question in #[yourchoice]. More importantly, the people with whom users share information on their public profiles are more often than not people they interact with outside of cyberspace. This means that actions and words within the Web carry a certain accountability on the outside. Where once it was possible to sign off and change usernames after an uncomfortable exchange, it is now possible to be grilled on a similar exchange at lunch the next day. Then doesn’t it stand to reason that a filter of propriety now applies to conduct on the internet where once it was filterless? Your nick becomes your birth name; your channel becomes your family, workplace, city, school. The trend toward reification online can be seen in many critics of social media, especially when children and teens are concerned. Parents and commentators warn against having friends one hasn’t met in the real world. Online predators pose as people they’re not. Cyber-bullying has as great and as tragic effects as bullying on the playground. I think of these and other scenarios as the issues and tensions of the real world bleeding over into cyberspace as more people in the United States and around the world begin to use the internet in their daily lives. Compare Myspace and Facebook today and see a racial and socioeconomic divide. In 2007 or so, huge numbers of white-middle-class-American-kids (myself included) made the switch from one to the other, citing the sites’ differing impressions of safety and security, class, and sophistication. In the following years, users of each site rarely interact. Since Rodríguez wrote, the focus and purpose of connecting with people on the Web has definitely shifted. Several times in the last year I’ve been “lurking” on a Facebook friend’s activity and come across a heated argument relating to politics, race, ethics, religion, etc. One vocal opponent leaves paragraph-long comments on a picture or status, inspiring the wrath of mutual or unconnected friends or acquaintances. Invariably, someone suggests deleting the offending person. I see two problems here. First, here is the urge to remove this person who disagrees with you from the list of “friends” who can interact with your online personality, thus narrowing the ideological circle through which you move online. The second involves the language used (and I’m a firm believer that the way we speak shapes the way we view the world). Delete this person from your mind, banish her/him from your thoughts, remove the unwanted influence. While I understand that some people can be downright rude and insensitive when posting comments, and that’s no fun for anyone, it’s an impulse that I’ve seen applied to arguably unwarranted situations. If there’s any unified thought that can be pulled out of this post, I guess it is this: while Rodríguez wrote of the internet’s potential for fluidizing identity and its performance, the current social media boom does the opposite, fostering a sense of self-imposed isolation and locking users’ online presence into a set of predefined categories. I think it’s dangerous, but is anyone really going to burn their Facebook?